Food, drink, live music and traditional pub culture where fine wines,craft & cask ales and Continental beers are served with pride and satisfaction. Situated in the ancient heart of the city, the Cardinal’s Hat is Worcester’s oldest inn and thus has plenty of experience when it comes to pleasing hungry and thirsty visitors over the years. Long-considered a local landmark, this historic watering hole is now a labour of love of local food, drink, live music and traditional pub culture where fine wines, well-kept craft & cask ales and Continental beers are served with pride and satisfaction. With its imposing red brick façade and stunning location in Friar Street, the Cardinal’s hat is a handsome example of an English city pub. 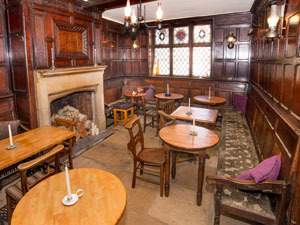 Three storey’s high and oozing with charm this independent free house – which originally hails back to the fourteenth century – is the perfect place to meet family, friends and colleagues. With over 30 years in the pub trade Nigel, Sadie and the team will make sure you feel welcome. Whether passing by for a quick pint or settling in for a leisurely platter of the region’s finest fare, or stopping to sup a cool draught Wye Valley HPA, the Cardinal’s Hat has something for everyone.